Sangeeta is back again with a lovely, wholesome, North Indian dinner. Much appreciated, Sangeeta, and you know that. Enjoy dinner from Sangeeta. May you be inspired – everyday! Hello everyone at Everyday Gyaan . I am back with one of my everyday meals , fondly called ‘daal roti‘ in the North India . Daals or lentils are great proteins for vegetarians and vegans and I love my lentils in any form or color . So, at my home, you’ll find a yellow lentil cooked with some greens one day, or some black lentils in a spicy hot gravy the other day, accompanied with a flat bread called chapati or roti. My platter today is something a simple North Indian family eats everyday with minimal effort . We don’t make elaborate salads for or side dishes usually. Just a few slices of onions or cucumbers, carrots or any other seasonal vegetable is enough as the the stir fried vegetables (subzi) make up for the dressed salad . For this kind of meal you can make chapatis with whole wheat flour . You can find detailed instructions for making chapatis and another classic daal recipe on my blog here . This is a very simple and quick dish which gets ready in 10 minutes, even if you start counting from the time you start chopping the okra! Just take care to wash the okra and drain it well. Let the surface dry well before cutting it into small pieces . Otherwise okra has a tendency to get slimy , especially if you are cooking it in less oil . I fried this okra in ghee (it is not bad for you believe me) with just salt and pepper to taste, just until the okra got softer but not browned. 2 tsp of ghee for 250 gm of okra is enough. The daal in the platter is called ‘sabut masoor ki daal‘ – whole red lentils with a brown colored skin are used for this daal preparation. The recipe of the daal is also simple, but it takes a bit more time to cook. It needs about 20 minutes of pressure cooking. But you can do other things in the kitchen while the daal is cooking. I made the okra stir fry , sliced the onions and even rolled out chapatis while the daal was cooked!! To proceed, boil the red lentils and the specified ingredients in a pressure cooker for about 20 minutes, keeping the heat level low after the whistle blows. Or boil them in an open pan till the lentils are cooked and mushy. For tempering the daal, heat the ghee in a pan and add the cumin seeds and wait till they crackle. Switch the flame off and add the everyday curry powder and red chilly powder in the hot ghee and mix well. You will see the powders foaming in the hot ghee as they get very aromatic. Add the cooked daal to the pan and mix well. Finish with ginger juliens and chopped coriander leaves . Serve hot with chapatis . 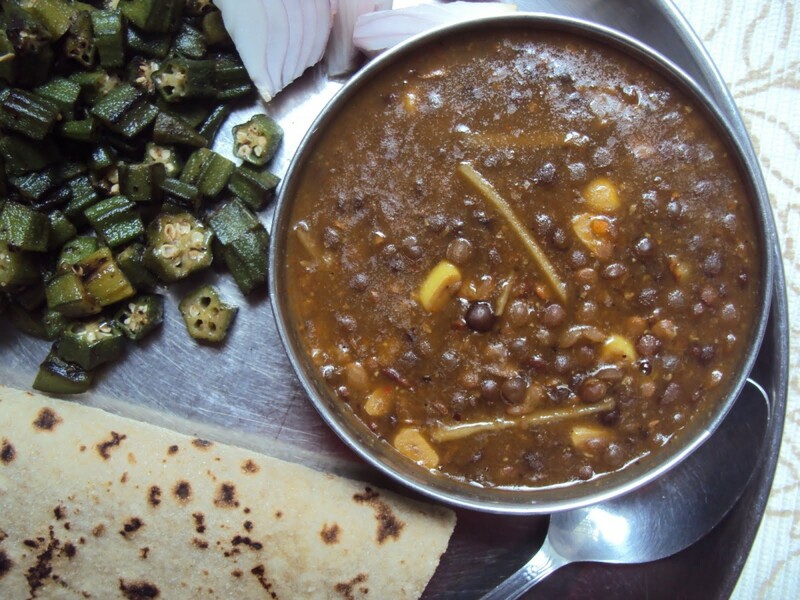 This daal is best suited with chapatis , but can be enjoyed any way you want. 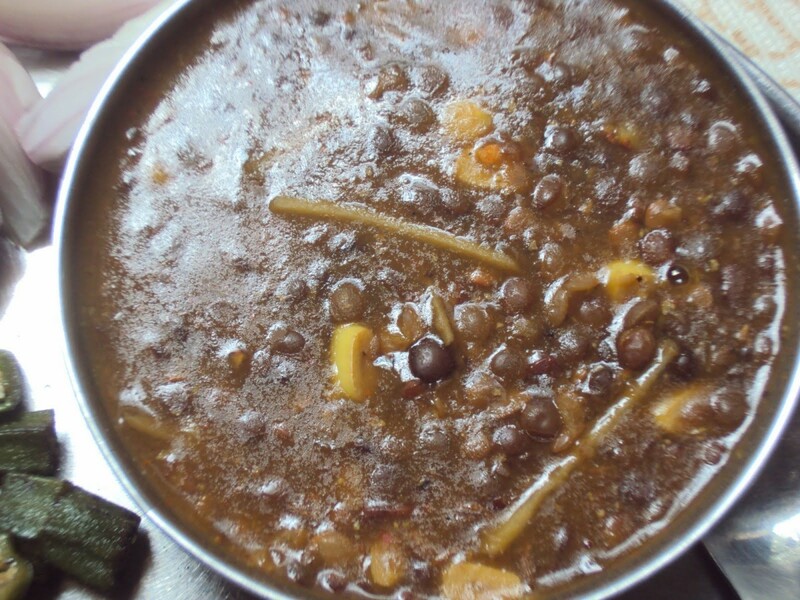 A thin version of this daal can make a nice lentil curried soup. I hope you will enjoy this dinner platter from my kitchen. 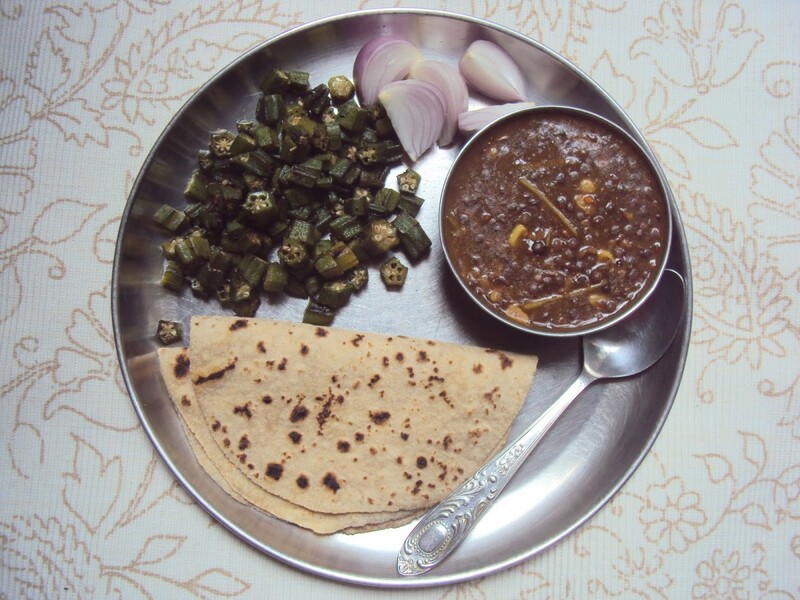 I like my dinner very simple and just the daal and chapati most of the times or a light curry with chapatis. But there are phases when I love only soups , especially during the winter months, or cold salads on very hot summer nights. This kind of dinner is suited when there are more people at the dining table , so you enjoy a slightly bigger meal. I will be away for a while and may not be able to see you feedback here, but I will be back to answer any queries or suggestions when I come back. Thanks everybody for the great response and for trying out my kind of food in your kitchens .